When, after having read in Strabo chapters which treat of Asia, one looks on a modern map for the names of the people, the states, the mountains, the rivers, and the cities which the geography of the first century named and described, surprise is great; it is with difficulty that one recognises some names of Iranian or Semitic origin; all the others are new and are spoken in barbaric tongues; Ionia is Turkey in Asia, the Taurus is called Giaour Dagh, Hyrcania has become Khwarezm (Kharezm), and one has to guess at the Oxus and Yaxartes under their names of Amu and Sir-Daria. Without doubt the names of people and places have changed in western and central Europe since the days of Strabo, but not in the same degree. To the Arab geographers the Aral was only known as the Sea of Khwarezm, by which name and that of the Sea of Urghunj it is still called by the people of the Khanat. According to Generals Mouravief and Romanof, Aral Denghiz, the Kirghiz appellation, signifies the Sea of Islands, while others maintain that its proper signification is the Sea of Eagles. The ancient territory of Chorasmia - which was situated in the plain of Western Asia watered by the mighty river Aces, and whose governor gave in his submission to Alexander when the Macedonian army was in winter quarters at Balkh, 'the Mother of Cities,' - was the forerunner of the 19th Century Khanate of Khiva. The earliest notice of Khiva by a western historian is generally considered to be that contained in Menander and included in the account of the envoy Zemark, who was sent in the sixth century by the Emperor Justin to Djizabul, the Grand Khan of the Turks. Zemark, apparently, stayed in Kath, the old capital of Khwarezm, on his return journey to Europe; and, after having crossed the Oich (Oxus), passed by the fortified towns of the country upon the left bank before he arrived at the ' great and wide lagoon' of Aral. The next notice of the territory seems to be that of the Chinese traveller Hiouen Thsang, who in the seventh century describes Khiva as forming but a narrow band of cultivation upon both banks of the Oxus. The shahs of Khwarizm are frequently mentioned as overthrowing the minor dynasties which arose with the decay of the Seljuks. These rulers were descended from Anushtajin, a Turkish slave of Ghazni, who became cupbearer to the Seljuk Malik Shah, and afterwards governor of Khwarizm (Khiva) in 1077. In 1138 the third of the line, Atsiz, revolted but was defeated and expelled by Sinjar. Shortly afterwards he returned, firmly established his power, and extended the Khwarizm Empire as far as Jand on the Sihun. The brief reigns of Il-Arslan and Sultan Shah Mahmud were succeeded by that of Tukush (1172-1199) and Ala ed-din Mahommed1 (1190-1220). The former of these subdued Khorasan, Rai and Isfahan, while the latter brought practically all Persia under his sway, conquered Bokhara, Samarkand and Otrar, capital of the Karakitai, and had even made himself master of Ghazni when his career was stopped by the hordes of the Mongol Jenghiz Khan. It was this prince who destroyed the Ghorid dynasty, which claimed descent from the legendary Persian monarch Zohnk. Except for a brief period of submission to the Ghaznevids, they ruled at Ghor until 1215, when they were conquered after a fierce struggle. In 1231 the last of his house, Jelal ud-din (Jalaluddin) Mangbarti, or Mango-berti, was banished, and thus the empire of the Khwarizm shahs, which for a brief period had included practically all the lands conquered by the Seljuks, passed away. The Kharismian empire of Turkestan, Persia and North India extended eastward to Kashgar, and it must have seemed one of the most progressive and hopeful empires of the time. Jengis Khan, while still engaged in war with the Kin empire, sent envoys to Kharismia. They were put to death, an almost incredible stupidity. The Kharismian government, to use the political jargon of today, had decided not to "recognize" Jengis Khan, and took this spirited course with him. The renown of Jenghiz Khan's victories had been prodigious among the Turks of Transoxania; the grandeur of Rome and that of the caliphate had not effaced in their minds the memory of an almost superstitious admiration for that China, model of all splendour, type of all empires, which had so often dazzled or conquered their fathers. At first they did not wholly believe in it. Muhammed the Fighter pressed with questions the ambassador whom Jenghiz Khan had sent him; this was a Moslem Turk, called Mahmud Yelvaj, who was fanatical in his nationalism and devoted body and soul to his master, the pagan emperor of the Mongols. " One day Muhammed took Mahmud to the chase and said to him: ' Thy khan, did he really conquer the land of China ? '-and he detached from his arm a jewel of infinite value and made a present of it to Mahmud Yelvaj." The secrecy of the interview, the solemn oath which was taken, the attitude of those present, all betrayed anxiety. These Turks of the Occident felt that they could not successfully contest the game against a Turk who was master of China. The sultan of Khwarezm, Persia, and Transoxania must indeed have been blind not to see the approaching storm. He was, moreover, a weak-headed individual, with all the faults of his race and none of its virtues. Ever since Jenghiz had won the name of " second Alexander," after his victory over the hunted and betrayed Kurkhan, Muhammed the Fighter was no longer sceptical. 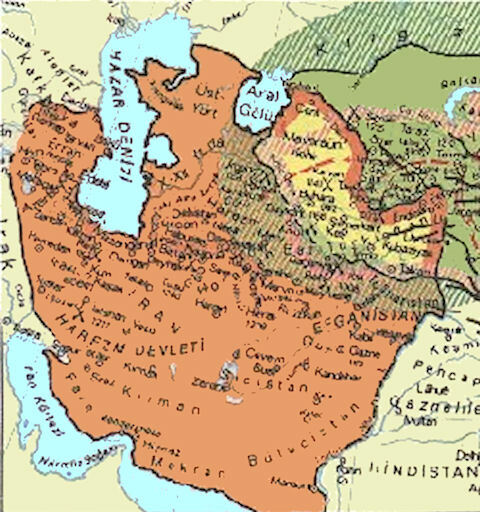 Southern Persia, Afghanistan, the marches of India were divided amongst a number of feudal lords, most of them of Turkish origin, calling themselves atabegs, "father governors," and using as their chief weapon the name of the spiritual sovereign of the caliph of Baghdad, who sold them the privilege of his suzerainty. The Fighter himself was only the delegate of the caliph through the heritage of the Seljuks. To attack the atabegs without asking permission of the pope of Baghdad was to revolt against him, to begin a "quarrel of investitures." The pope protested; the Fighter got angry, and, in an access of rage, marched upon Baghdad. At the same time that he was quarrelling with the pope of Islam, the Fighter was alienating his own subjects. In an access of fury after drinking, he killed the sheikh Madjd ad-din of Bokhara, the highest Moslem authority of his empire, the primate of Transoxania, accusing him of being the lover of his mother, the old Turkan Khatun. Become sober he perceived his mistake. The old empress was a Kankli, adored by all those riders among whom the voice of blood and of feudal relationship was so powerful. The clergy of the bigoted capital became agitated and preached in the mosques of Bokhara. The sultan sent a platter filled with gold and precious stones to the sheikh Nedjm ad-din Kubrah and said to him, ' For this my sin give me absolution.' The sheikh replied, ' It is not with a ransom of gold and of precious stones, but with your head, mine, and those of thousands of people that your act will be redeemed.'" Through his Moslem agents Jenghiz Khan had been informed of all that transpired. He even received an embassy from the caliph urging him to begin hostilities; but, always punctilious in points of honour, he wished not to open the breach until the sultan of Khwarezm had given him definite cause. In the mean while he put the sultan off his guard and flattered him through his ambassador. They ended by concluding a treaty of offensive and defensive alliance at the end of which was a little supplementary clause, seemingly insignificant, a commercial convention giving free passage to caravans coming from China across Turkestan and Transoxania. This relinquished to Jenghiz Khan the "silk route," the main road towards Irak and Rome. That which the Sassanids had refused to the Turkish il-khan of the sixth century at the risk of an alliance between him and Constantinople, the Fighter granted to his terrible friend Temujine, without weighing its consequences and as if it were a mere bagatelle. The treaty concluded, he set forth on his foolish expedition against the caliph. He bravely conquered the sultanates of Persia, became entangled in the snows of Armenia and Kurdistan, and came back excommunicated. The caliph forbade in the churches the khotba, or prayer for the sovereign. He put him under the ban of Islam, as a rebel, a schismatic, and a felon. That involved the release of all the Moslems, his subjects, from their oath of obedience. There had been a considerable number who had long been disposed to profit by the dispensation and to take sides openly with the great protector of all the Turks, the " inflexible" emperor. The governor of a frontier town precipitated matters in Turkish fashion; the great caravan had just come from China; he seized the merchandise and cut off the heads of the merchants. Denounced by Nedjm ad-din, excommunicated by the caliph, threatened by the Kanklis and by the nobility, upbraided by his mother and by his son Jelal ad-din, the unhappy Fighter did not dare to denounce the deed. Jenghiz Khan had sent him three ambassadors to demand reparation; he had one decapitated and drove off the two others. A month earlier Temujine had begun to mass troops on the Irtish; as soon as the good news reached him he sent out his scouts m order to conceal his movements from the enemy, and to complete the concentration of his main army (1219). The Khwarezmians were unprepared. With feverish haste the ardent Jelal ad-din collected his contingents, compelled his father to accompany him, that the troops might see the sultan at their head, and went to meet the Mongols. At the end of the year 1219, after a battle between the Karadagh and the lower Sir-Daria, Muhammed could no longer deceive himself. He took the step of re-entering Transoxania, and of assembling his great army behind the Sir, in the shelter of the strongholds which protected the passes. It was a terrible blow for Muhammed when in the first days of March he learned that the great Mongolian army had just emerged from the "red sands," that the cities of Zernuk and Nurata had surrendered, and that Jenghiz Khan was marching upon Bokhara. He understood that all was lost, and he fled to Samarkand. Jenghiz Khan, concealing his march, had boldly crossed the desert of the red sands and emerged in Transoxania, marching thence straight upon Bokhara in the rear of the sultan of Kwarezm. The garrison of the city-twenty thousand men, say the Moslem chronicles-tried to cut its way out, probably hoping to rejoin the sultan at Samarkand; it was defeated, and Bokhara " the holy " opened its gates to the pagan emperor. "All the sheikhs, the mollahs, the muftis, all the inhabitants, great and small, went out from the city to put themselves at the mercy of the khan" (April, 1220). From Bokhara Jenghiz Khan hastened to Samarkand, where the sultan Muhammed had abandoned his army. There were there about forty thousand men, disorganised and demolished by the flight of the sultan and by the departure of Jelal ad-din. They bravely accepted battle and fell upon the Mongols, while these were manoeuvring to invest the place, they repulsed them and made some among them prisoners, but the next day they were driven back behind the walls. The clergy and the citizens then took flight; the sheikh ul-Islam and the cadi opened one of the gates while the garrison was being massacred in the defence of the other gate. The city escaped plunder by paying a tax of 200,000 pieces of gold, but thirty thousand men of arts and crafts had to leave their hearths to go to Karakorm, to China, and to Siberia, to work for the "inflexible" emperor, his princes and his nobles.